Toast the sesame seeds , about a cup, cool them; place the seeds in a blender with olive oil, you might need 1/2 to 1 cup of the oil. You are looking for a consistency like the one you see in a Béchamel Sauce while the sauce is hot (when Béchamel is cold it tends to thicken). Transfer to a glass jar and use as need it in different dishes. Tahini sauce, about 1/4 cup, add more if you like the flavor. Add 1 tbsp of olive oil. Add water and blend; here comes the tricky part, water amount varies, sometimes garbanzos are more or less dry. You need to adjust the water, remember you want a smooth consistency, something you can spread or dip your chips on. You do not want your chips to stay in the bowl every time you reach into your dip. Use crudites instead of chips or bread. Spread in sandwiches to add more protein to your meal. Use it as a mid-morning snack. 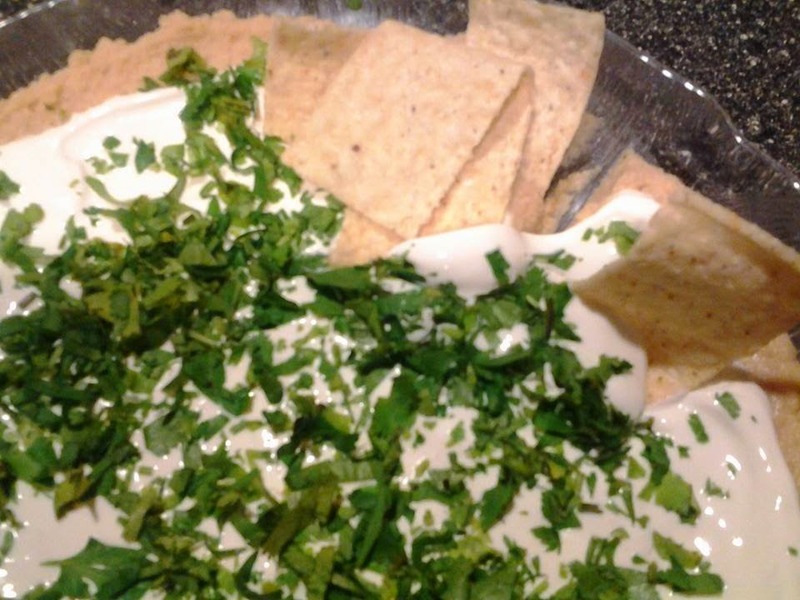 On the picture, I spread the hummus on a single layer directly onto a platter; and then spread a single layer of sour cream follow with chopped cilantro. Have Fun Cooking and Enjoy!! !